Families of the 96 Liverpool fans who died in the Hillsborough disaster say justice has finally been done after an inquest jury concluded the victims had been unlawfully killed. Lawyers acting for the families say the conclusions, at the end of the longest jury case in British legal history, had completely vindicated their tireless 27-year battle. The news has prompted a widespread reaction from the families, fans, campaigners, politicians, and sporting bodies. 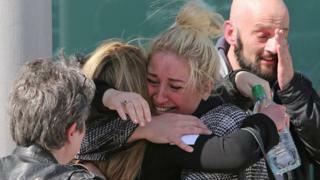 Margaret Aspinall lost her 18-year-old son James in the disaster. She says she was immensely grateful to the people of Liverpool for backing the fight for justice. "Let's be honest about this - people were against us. We had the media against us, as well as the establishment," she said. "Everything was against us. The only people that weren't against us was our own city. That's why I am so grateful to my city and so proud of my city. "They always believed in us." Tracey Church lost her brother Gary in the disaster. She says she was overcome with emotion following the jury's conclusion. After holding up a red flag that read "We climbed the hill in our own way", she said they had campaigned for "years and years" to get justice. She added: "It's surreal. (I feel) emotional, shaken, happy, sad - all mixed emotions." Stephen Wright, whose brother Graham died in the tragedy, said the responsibility for the disaster was "the gross failings of the police". "The evidence over the past two years has been overwhelming, yet South Yorkshire Police and their senior officers have tried to look truth in the eye and deny responsibility and shift blame onto others. "In particular, innocent football fans. For 27 years, we the victims of this tragedy have had to live with the outrage of such institutional denial." "For this reason, we the 22 families call for the immediate resignation of David Crompton, the chief constable," he added. Barry Devonside lost his only son Christopher, 18, in the Hillsborough disaster. Mr Devonside, who has attended every day of the inquest, said: "Today we gained the confidence from the jury that what we've tried to do for 27 years is to bring justice for those who never went home. "I never thought in my wildest dreams that we would get this decision. I always hoped and dreamt that we would get this decision. I'm glad we did. We did our best - we couldn't do any more." Charlotte Hennessy, whose father James died, said from both the police and South Yorkshire Ambulance Service it was a "hopeless emergency response", saying they "failed the 96". "Despite having a designated unit at the ground, with two station officers, two other personnel and an ambulance, they failed to react to the disaster unfolding before them. "From both the police and ambulance service it was a hopeless emergency response and undoubtedly increased the loss of life." Trevor Hicks, the father of teenage sisters Sarah and Vicki Hicks - who both died at Hillsborough - said campaigners had done their job. Mr Hicks said: "We've known all along what happened. Obviously it's took us 20-odd years to get here. "I didn't know whether to laugh or cry, to be fair. I think if anyone is a winner today, it's society at large in that, no matter who you are, how big you are, or where you are in your organisation, the public will come after you if you do anything wrong." 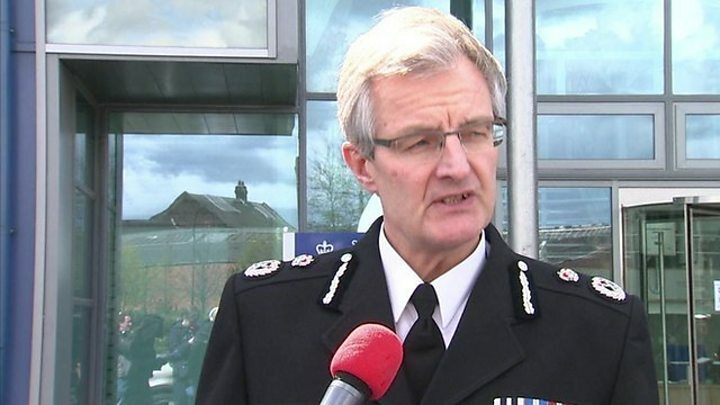 Commenting specifically about the role of South Yorkshire Police, Mr Hicks said: "Obviously they've got to face up to the fact - even throughout these proceedings - at the way they have conducted themselves. "I go to back to what [Lord Justice] Taylor said [in his 1990 report into the disaster] in the very beginning - it would have been better if the truth had been faced." The Prime Minister paid tribute to Hillsborough campaigners and said it was a "landmark day" which provides "long overdue justice". David Cameron tweeted: "Landmark day as the #Hillsborough inquest provides long overdue justice for the 96 Liverpool fans who died in the disaster." In a second tweet the Prime Minister wrote: "I would like to pay tribute to the extraordinary courage of #Hillsborough campaigners in their long search for the truth." In a statement he said: "Today is a landmark moment in the quest for justice for the 96 Liverpool fans who died on that dreadful day in April 1989. "It is also a long overdue day. The bereaved families and survivors of the Hillsborough disaster have had to wait 27 long years for the full facts of what happened and it is only due to their tireless bravery in pursuing the truth that we arrived at this momentous verdict. "All families and survivors now have official confirmation of what they always knew was the case - that the Liverpool fans were utterly blameless in the disaster that unfolded at Hillsborough." Chief Constable of South Yorkshire Police, David Crompton, said: "I want to make it absolutely clear that we unequivocally accept the verdict of unlawful killing and the wider findings reached by the jury in the Hillsborough Inquests." "After 27 long years the true verdict has finally been delivered, confirming what the families always believed - their loved ones were unlawfully killed. "Liverpool Football Club welcomes the jury's decision, once and for all, that our supporters were not in any way responsible for what happened at Hillsborough. "We will always remember the selfless bravery and heroism of the many fans that helped their fellow supporters in the most harrowing of circumstances that day. We praise those who, since the beginning of the inquest, have had to find the courage and strength to re-live what they went through. "Since April 15, 1989, the solidarity shown by Liverpool fans towards the families and survivors encapsulates the unique character of both the club and city. We are also hugely thankful for the unwavering support the wider football community has so generously shown these past 27 years. "It has been a painful journey for the families and survivors, who have endured and sacrificed so much for so long. The resilience and dignity they have shown throughout their tireless campaign has been humbling and inspirational. Their conduct and actions throughout their struggle has brought pride to the city of Liverpool and will serve as a lasting tribute to the victims. "The 96 men, women and children who were unlawfully killed at Hillsborough will never be forgotten." "I have come to know the families well and today represents a huge day in their pursuit of truth, justice and accountability. They have waited for 27 years to reach this point. They continue to be in my prayers as they absorb this momentous decision. "The panel's report represented the first step forward on the road to truth and ultimately justice, but the conclusion of the fresh inquests is not the last step. "It has been a privilege to chair the family forums. I am pleased to say these will continue because it is important that the families continue to have direct contact with the investigation teams and the CPS through this next phase." Minutes after the verdict was announced, John Aldridge, who played for Liverpool FC at the time of the disaster, tweeted: "fantastic to see the reaction of the families outside the court!very emotional as well,The truth is out AT LAST.Take note all the doubters!!" Michael Owen tweeted: "Just landed from China and catching up with the news. Finally and way, way, way overdue, the truth prevails and justice is served. #jft96." Jamie Carragher tweeted: "Justice finally. #JFT96"
Wayne Rooney also posted: "At last justice for the 96 and their families. Well done to all who never gave up #jft96"
Roy Evans, the former Liverpool FC manager tweeted: "Finally after 27 years what we've known all along has been confirmed. Thoughts with all the families an those affected. Justice for the 96 x"
Phil Thompson, former Liverpool captain, tweeted: "Well done to all the families, they've all fought with integrity and dignity throughout, justice has now been done"
Former Liverpool manager Rafael Benitez also added a message of support in a statement, saying: "After so many years fighting for justice I am really pleased to see the verdict today, which confirms what we have been saying for a long time. "I am especially pleased for the families of the 96 who have sought justice for so long and with such dignity, as well as for the people of Liverpool and for football fans in general. "Hopefully this verdict today will ensure that this kind of tragedy can never happen again." Kenny Dalglish MBE, former Liverpool footballer and manager, said: "Everything they've fought for for the past 27 years, they've won. Every argument that was put in front of them. They've been totally vindicated, the fans, and the families have also been totally victorious in everything they put forward. "The truth that they knew 27 years ago has just come to pass now, and it's taken them 27 years of their lives to fight for the person who went to watch a football match and lost a life. You cannot surmise, or even begin to guess, what those families have been through." Liverpool chairman Tom Werner also released a statement, adding: "We have been moved and inspired by the great courage shown by the families and survivors. We feel deep sorrow for their loss, take inspiration from their campaign and express gratitude for bringing honour to the club through their conduct during this cruelly prolonged process." Former Liverpool captain Steven Gerrard, whose cousin, 10-year-old Jon-Paul Gilhooley, was the youngest victim of the tragedy, posted a tribute on Instagram, showing the Hillsborough memorial at Anfield alongside the words: "JFT 96 #YNWA". Sheffield Wednesday FC: "First and foremost, we recognise the tireless dedication of the families who have remained dignified throughout this process despite the enormously difficult evidence that had to be heard in detail over the course of the inquests. "Since the disaster, football has evolved immeasurably, with all stadia and associated safety procedures changing beyond recognition in the intervening years. "Both the ownership and leadership of Sheffield Wednesday has also changed in this time and we reiterate that the sincere condolences of the current chairman, board of directors and everyone at the club remain with the families of the 96 and our thoughts are with all those affected by the tragic events of 1989." Everton FC: "Everton Football Club salutes the Hillsborough families and their total vindication as Fighters for Justice. Theirs is the greatest victory in the history of football. "RIP, the 96. Good night, God bless. From us across the Park." Former Sun editor Kelvin MacKenzie, who oversaw the newspaper when it published a story blaming Liverpool fans for the Hillsborough disaster, has said his "heart goes out" to the families and friends who have waited for vindication. The Sun ran a front page story four days after the tragedy proclaiming to tell "The Truth" about the human crush which left 96 people dead. It featured claims from an anonymous policeman that some fans had "picked pockets of victims", "urinated on cops" and that some beat up a policeman giving the "kiss of life". Mr MacKenzie has now apologised for the "hurt" the story caused. In a statement he said: "Today's verdicts are an important step in obtaining justice for the victims. My heart goes out to those who have waited so long for vindication. "As I have said before, the headline I published was wrong and I am profoundly sorry for the hurt it caused." He said his paper's coverage was based on what is now known from the inquest to be "deliberate misinformation from the South Yorkshire Police". "Clearly, I was wrong to take the police's version of events at face value and it is a mistake I deeply regret." Mr MacKenzie added: "The Crown Prosecution Service must now ensure that those officers within South Yorkshire Police responsible for the cover-up are brought to trial." Mr Richardson said: "We would like to say sorry on behalf of the company at that time and to add our deepest sympathies to all those affected by this tragedy. "We would also like to add that we are a very different company today and there is no-one here who has any first-hand knowledge of the stadium design decisions concerning Hillsborough in the 1980s. "This was a terrible, tragic incident that will never be forgotten and out of the disaster there has come a legacy of improved stadium safety throughout the country." "Our sincere condolences remain with the families and friends of the victims. They have conducted themselves with great dignity throughout these Inquests, during which there has been an exhaustive investigation of the horrific circumstances that took place 27 years ago. "Ultimately, the Inquests stand as testament to the struggle undertaken by the families so the truth might be brought to light. "While much has changed since 1989, the FA and English football in general must continue to recognise, remember and learn from the tragedy. In looking forward, it is important we never forget. "Given the ongoing criminal investigations, there are limitations to what we can say. It is in the interests of all concerned that further consideration of the disaster by the relevant authorities must be allowed to take its course." Ms Hemming said: "Following the inquest's determinations the CPS team will continue to work closely with Operation Resolve and the IPCC as in due course, the CPS will formally consider whether any criminal charges should be brought against any individual or corporate body based upon all the available evidence, in accordance with the Code for Crown Prosecutors. "We would ask that everyone is mindful of the continuing investigations and the potential for future criminal proceedings when reporting or publicly commenting on the inquest's conclusions." Ms Cerfontyne said: "The conclusion of the inquests is another milestone and a day when my thoughts are with the families and friends of those who died as a result of the disaster. "Now the inquests have ended our role in providing documents and other material to support the Coroner is over. However the end of the inquests does not mark the end of the process. "Our attention now focuses on concluding our criminal investigation into the aftermath of the disaster. This is by far the biggest and most complex investigation ever undertaken by the IPCC. "We have made significant progress on the investigation and we will continue to work closely with Operation Resolve and the Crown Prosecution Service to pursue our remaining lines of enquiry as quickly and as thoroughly as possible. I anticipate we will conclude the criminal investigations by the turn of the year." Malcolm McMahon said: "I hope that the acknowledgment that those who died were unlawfully killed will bring comfort to the survivors and the families of the 96. "May they rest in peace, to be for ever remembered in the hearts and minds of the people of Liverpool."